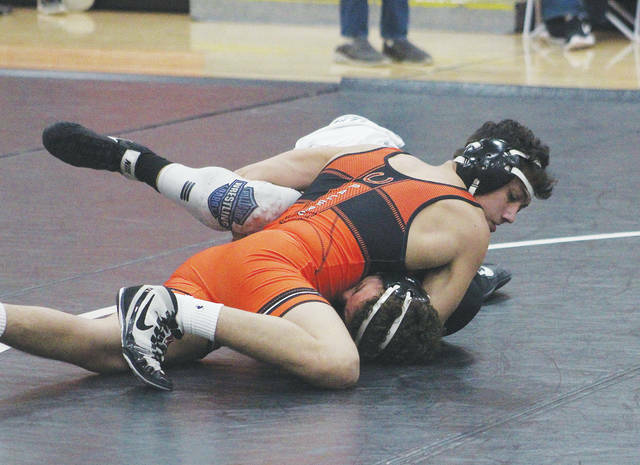 Hayes Zach Williams, top, won a championship at 138 to highlight the Pacers’ sixth-place showing at Saturday’s Delaware Hayes Rieman Invitational. Zach Williams wrestled his way to the top of his weight class and Corbin May nabbed runner-up honors in his to lead the Pacers at Saturday’s Delaware Hayes Rieman Invitational. Williams barely broke a sweat en route to capturing a championship at 138. After pinning a pair of opponents in pool play, he pinned Central Crossing’s Austin Vazquez in 40 seconds and blanked Olentangy’s Kaden Doup 12-0 to punch his ticket to the championship match — a match he won 6-2 over Cincinnati Elder’s Bartley Thomas. May also had a nice run, cruising to the championship match at 182 before falling to Dublin Coffman’s Lennox Wolak by a tight 7-4 margin. He won his lone match in pool play before following up a first-round pin with a solid 6-2 win over Olentangy’s Colton Doup in the semifinal. Olentangy Berlin’s Corey Hill also made some serious noise, nabbing runner-up honors at 160. After winning a pair of matches in pool play, he pinned Dublin Scioto’s Noah Keener in 1:50 and edged Hayes’ Emmett Cain 8-5 to set up a championship showdown with Freemont Ross’ Jackson Weissinger — a match Weissinger won 8-2. Cain, meanwhile, knocked off Elder’s Patrick Barrett 6-2 in the third-place match to help pad the Pacers’ point total. Hayes’ Mason Sutandar also nabbed third-place points, pinning Coffman’s Nick Copley in his final match at 170. Other area standouts included Kaden and Colton Doup, Hayes’ Jacob McCloskey and Nate Robinson and Berlin’s Isreal Foston, who were fourth at 138, 182, 195, 220 and 152, respectively; and Olentangy’s Nick Varanelli, Adam Orndorf, Mohammed Hussein and Dan Delgratta, who were fifth at 132, 152, 160 and 195, respectively. Coffman captured the team title with 268 points while Elder and William Mason smoothed out the top three with respective totals of 265.5 and 219.5. Hayes finished sixth with 164 points, Olentangy was ninth with 103.5 and Olentangy Berlin closed 12th among the 14 teams in action with 54.